It might be the longest bull market, but the 1990s bull market saw substantially higher returns. Market breadth continues to support higher equity prices and eventual new highs. The bull market will celebrate its tenth birthday on March 9, 2019. During that period, the S&P 500 Index has increased more than fourfold in value, producing a total return of 410% (17.7% annualized) while rising 314% in price. Concerns over the global economy, along with a potential policy mistake by the Federal Reserve (Fed) and the trade dispute with China, all have many wondering just how much the longest bull market ever could have left in the tank. This week, we’ll show why this bull market is indeed alive and well and could make it to 11 next year. On March 9, 2009, the S&P 500 closed at 676.53, marking the low point for the worst bear market in stocks since the Great Depression. Few believed it possible at the time, but that marked the beginning of the longest bull market, at 120 months, since World War II [Figure 1]. 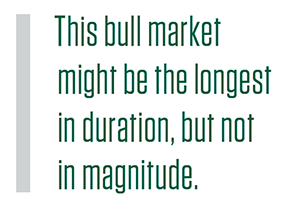 But while this might be the longest bull market ever, it isn’t the strongest. Stock prices in the 1990s bull market increased by 417% at the peak, more than 100 percentage points above the current bull market. This comparison is reassuring, as it shows this bull might not be as extended as many think. Although it may feel like this bull market has done nothing but go up for 10 straight years, that couldn’t be further from the truth. In fact, this bull market is the only one ever with two 20% or more declines based on intraday prices. In October 2011 and again in December 2018, the S&P 500 fell 20% from prior highs, only to rally by the daily close to narrowly avoid entering a bear market. It’s worth noting that the S&P 500 hasn’t made a new high since September 20, 2018, so one could argue this bull market may have ended then. We can’t disagree, but with the S&P 500 only 5% away from making new highs, for the sake of argument, we’re going to assume this bull market is still alive and that the S&P 500 can make new highs later this year. Near term, from a technical analysis perspective the stock market is clearly overbought, suggesting a break may be warranted and could come at any time. Additionally, we see potential warnings signs from put/call ratios becoming too complacent (market participants are not doing a lot of hedging against potential stock market losses) and investor sentiment polls revealing too many bulls, which makes sense after the 19% rally since December 24. Here’s the catch though: These are short-term sentiment measures —in the bigger picture, we have identified three signs that we could still be a long way from the euphoria we tend to see at major market peaks. 	According to the Commodity Futures Trading Commission, speculators have their largest short position against the S&P 500 since November 2016. 	According to Emerging Portfolio Fund Research, $30 billion has been pulled out of global mutual funds in 2019, even as many global stock markets have risen by double digits. 	According to Bloomberg, 6% of all analyst ratings are sells, which is the highest level in nearly two years. As we discussed here last week, the underlying fundamental backdrop remains quite positive, we’re looking for earnings to potentially surprise to the upside in 2019, and we think stock valuations are still attractive relative to bonds despite this year’s gains. Turning to market technicals, market breadth measures how many stocks are participating in moves in broader indexes. One of the easiest ways to measure this is via advance/decline (A/D) lines [Figure 2]. An A/D line is a ratio of how many stocks go up versus down each day for a stock exchange or index. The thinking is, if many stocks drive broad market gains, then there are plenty of buyers and the upward trend should likely continue, all else being equal. On the other hand, if an upward move in a broad market gauge is driven by relatively few stocks, this can be a warning sign of cracks in the bull’s armor. One sign that market breadth continues to suggest higher overall equity prices is that various A/D lines have broken out to new all-time highs this month. In fact, the NYSE Common Stock Only A/D line has a good history of leading equities higher. With that indicator making new highs currently, new highs in equity markets might not be too far away. Despite its old age, we believe the 10-year-old bull market has quite a bit left in its tank. The ongoing benefits of fiscal policy, coupled with a more patient Fed, lead us to believe the economy may surprise to the upside in the second half of 2019. We don’t think it will be an easy ride, but we continue to expect eventual new highs in equity markets and reiterate our fair value target of 3,000 for the S&P 500, about 7% above Friday’s closing index price of 2,804. The NYSE Composite Index is a float-adjusted market-capitalization weighted index which includes all common stocks listed on the NYSE, including ADRs, REITs, and tracking stocks and listings of foreign companies. The index was recalculated to reflect a base value of 5,000 as of December 31, 2002.